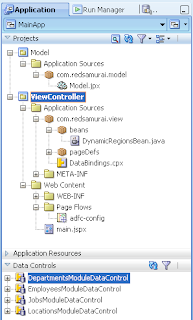 From my previous post - Integration in Oracle ADF with ADF Task Flows and Dynamic Regions, you can learn how to integrate separate Oracle ADF applications using dynamic regions. I'm sure, you will want to prevent user navigation from one region to another, when there are unsaved pending changes available. Its pretty simple in ADF 11g, I will describe today. I have updated sample application from my previous post, download updated archive - ADFIntegrationRegions2.zip. And that is great, because we can access Data Control and check it for any existing uncommitted data. 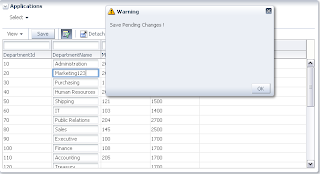 Update 2011/03/06: Check out updated sample application from Anything About ADF blog - Using Popup to Confront user to Save/Forget Changes. This is a very interesting approach to build. We are also trying to implement the same approach for its nature of reusability & modularization. Since this is a new concept, are there any drawbacks/limitations to this approach? I'm using this architecture for my projects, it works well. Also, Oracle is using something similar for their Oracle Applications. So far, I didn't noticed specific limitations. Only one thing - you should be careful with jazn-data.xml, it should be replicated across your applications. 2.) No idea how to use a database trigger that assigns a sequence to a primary key column of the table. 3.) If I add a CreateInsert button and say Commit, the backend triggers dont seem to fire at all. ALso new records are not created. Say there is a column for Moddate where the sysdate is assigned in the backend trigger. The app gives an error saying field has no values. Please help me out. Thanks. You could provide me a link with some details if its not of much trouble. 2.) Just use DBSequence type for primary key attribute in Entity Object. It will use DB trigger automatically then. 3.) 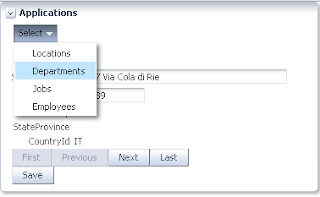 You should enable Update After Insert for that specific attribute. You can do this in Entity Object, just double click on attribute - you will see checkbox then under Refresh After group. With this architecture of only using page fragments we won't be able to use taskflows as dialogs since dialogs should contain jspx only. Is there any known workaround for this? We really want to use the capabilities of dialogs as it loosely couples with our pages without writing much code. Ignore my last comment about taskflow as dialog. My question is no longer valid as it is supported. is it possible to do "save and continue", "ignore and continue" and "cancel and stay on page"? Yes, you would need to implement custom dialog. I am not able to download the application .can u please help me.